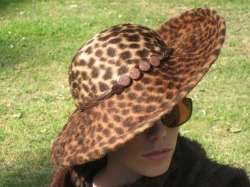 A truly elegant and refined tilt ocelot printed rabbit felt hat. Perfectly vintage in feeling and inspiration, pair this with your fur and best Hepburn heels to feel most glamorous. Colour and trimming choices as well as postage costs will be confirmed via email/phone.